Having a good time in art takes talent – and Robert Nelson obviously had a great time. 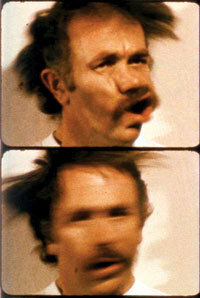 The films Nelson made with his friends in 1960s San Francisco – painters from the Art Institute, founders of the San Francisco Mime Troupe, composer Steve Reich, and other key figures in the post-Beat scene – are enduring records of artistic friendship, with an intuitive anarchic humor that still sparkles today. 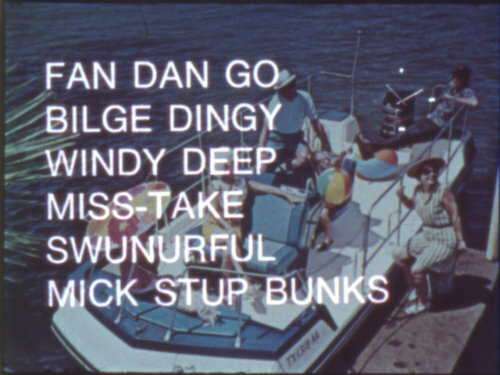 The titles of his films – Thick Pucker, Hot Leatherette, The Great Blondino, Oiley Peloso the Pumph Man, Sixty Lazy Dogs – give a sense of Nelson’s poetic, freewheeling absurdity. But beneath the camaraderie and humor were a committed artist and his radical, yet almost casually innovative ideas. With each new film, Nelson devised ingenious structures that in some cases prefigured later cinematic developments by years. Each work set a different challenge, and Nelson’s solutions often involved rethinking basic ideas about how film works, without ever losing a sense of fun. His early film Plastic Haircut has a unique symmetrical structure. For the soundtrack, Nelson undermined his own pretensions by improvising bogus comments about the very film we are seeing, making perhaps cinema's first-ever "director's commentary track." The inclusion of an early audio tape-collage work by Steve Reich shows the collaborative cross-media spirit of Nelson’s works. The Off-Handed Jape is an afternoon's lark made by Nelson and his artist friend William Wiley. The two men perform whimsical actions and poses for the camera, then recontextualize this imagery by improvising their own commentary on the action at a later time. Perhaps Nelson's most remarkable work is the hilarious Bleu Shut, a mix of game show TV, Mad magazine, and meditation on the nature of viewership. The film consists of "a boat game and entertainments." Nelson and Wiley attempt to guess the names of various boats, using a multiple choice list of possibilities (most of which are groan-inducing puns like “Aft-R-Yew”). The two men's humor is infectious and the viewer is drawn into the game. Meanwhile, the strange "entertainments" interrupt the preposterous game like commercials from an alternate universe. All the while, a clock ticks away in an upper corner of the screen, measuring the remaining time of the film. We end with a disquisition by Nelson on the meaning of the film (but will he finish before time runs out?). The result is one of the avant-garde’s funniest and most engaging films. Nelson’s importance as a filmmaker was underscored in the last decade, when the Academy Film Archive restored several of his surviving films. Film Love is proud to present Nelson's films in their original 16mm format. PLASTIC HAIRCUTS AND GOOD TIMES is co-sponsored by the Atlanta Contemporary Art Center. PLASTIC HAIRCUTS AND GOOD TIMES is a Film Love event, programmed and hosted by Andy Ditzler for Frequent Small Meals. Film Love promotes awareness of the rich history of experimental and avant-garde film. Through public screenings and events, Film Love preserves the communal viewing experience, provides space for the discussion of film as art, and explores alternative forms of moving image projection and viewing. Film Love was voted Best Film Series in Atlanta by the critics of Creative Loafing in 2006, and was featured in Atlanta Magazine's Best of Atlanta 2009.